Q. I can't install my old CD on Windows Vista or Windows 7. A. If you are trying to install from one of our older CDs on Windows Vista or Windows 7, the CD menu installer does not work in Vista or 7. To install Pretty Good Solitaire, you need to view the files on the CD and run the "gdsol.exe" file in the goodsol folder on the CD to install. To install Pretty Good MahJongg, you need to view the files on the CD and run the "goodmj.exe" file in the goodmj folder on the CD to install. The best way to view files on the CD is using Windows Explorer. Q. Is the game Spider always winnable? A. No, but it appears that it is usually winnable with a few exceptions. A game of Spider will be unwinnable if there are no possible plays in the final 10 card deal. When this happens, the game is blocked and cannot be won. This does not happen very often. 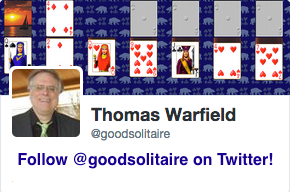 Q: Where can I find a solitare game called "Golf"? I can't find it anywhere and it was my favorite. A: Golf is one of the 600 games in Pretty Good Solitaire. You can also play it online. Q: I am looking to download a game that is referred to as 'Tuts Tomb'. I don't know if that is the actual name of it or not. All of the cards are set in an upside down pyramid and you have two piles at the bottom. The object of the game is to make the cards add up to 13 to take them out of the deck. A: Tut's Tomb is a variation of the classic game Pyramid. You can find it as one of the games in Pretty Good Solitaire under the name King Tut. Q. In Pretty Good Solitaire, when I go into a game the game plays itself. What is going on? A. This is the automatic game saving feature. When you quit a game in progress, the program will automatically save your position. When you play that particular game again, the program will replay all your moves up to the point where you left off. You can either continue playing or click on the new game button for a new game. The automatic game saving feature can be turned off in the Options menu. Q. What game numbers in FreeCell are impossible? #11982, #146692, #186216, #455889, #495505, #512118, #517776, and #781948. Q. What are the rules to Double Solitaire? A: While the overwhelming majority of all solitaire games are single player, there are a number of games considered solitaire that can be played by more than one person. These include games called Double Solitaire, Russian Bank, Spite and Malice, and others. For rules to these and other various two player solitaire games, see Pagat Competitive Solitaire Game Rules. Q: What is the name of the classic 7 pile solitaire game (the game that comes with Windows? A: That is the game called Klondike. Q: What is the highest score achievable in Microsoft Solitaire, using 3-card draw and standard scoring? A: The highest possible score is 24113, including bonus points for time. Q: What is the higest score without bonus points? 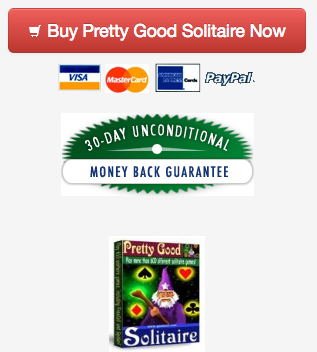 Download Pretty Good Solitaire for Windows: play hundreds of solitaire games on Windows XP, Windows 7, and Windows 10 including the standard solitaire game (called Klondike).